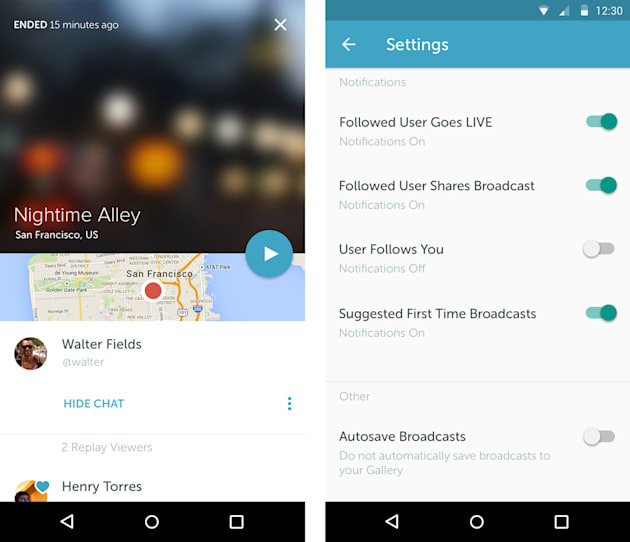 Periscope for Android is here. Twitter's new streaming app contains many of the same features found in the iOS version, but with a few Android exclusives. In addition to more granular notification controls than found in the iPhone version, there's a new "return to broadcast" feature that helps get viewers back to a stream after being interrupted by a phone call, text or other pesky distraction. The notification setting includes the ability to opt in or out of alerts when a followed user goes live, shares a broadcast or when a user gets a new follower. The alert settings are global instead of on an individual user basis. So if you turn off alert for when followed users go live, you won't be alerted if any of the folks you follow start broadcasting. The Return to Broadcasts feature places a notification on the Android home screen when viewing a feed is interrupted by a call or other item. When the viewer is done doing what ever it is that stopped them from watching a feed, they tap the alert and the app loads the feed they were previously watching. The development of the Android app was led by former Secret and Twitter Android lead, Sara Haider. Haider returned to the flock in March and immediately started building the Periscope for Android app. The team had to deal with the usual fragmentation issues that comes with dealing with the multitude of screen sizes out there. "It's been a jam packed last couple of months," said Haider. "I dealt with a lot of those challenges on Vine, so I'm not a stranger to them." The app supports KitKat 4.4 and later which made development "significantly easier" since it surfaces more of the hardware encoding and video APIs. It also has Material Design elements of Lollipop 5.0 including a dedicated broadcast button instead of a the broadcast tab found in iOS. In fact, on the Android version of the app you can swipe back and forth between tabs. While the two apps are similar and will continue to work towards parity, Haider said, "we also have the opportunity to do some experiments on both platforms."